For most of us, Labor Day weekend is the final cookout of the summer - a last chance to celebrate in the sun. While this holiday will probably include a busy grill, cooler full of beers and backyard game of wiffle ball, it assuredly means hosting swarms of relatives, friends and neighbors. A few of these you may have to put up for the night as well, so while you'll want the guest bedroom stocked with new sheets, freshly plumped pillows and plenty of space for suitcases, the bathroom is the real place to primp and prepare. Family or not, your guests' comfort is of the utmost importance, and where should they feel most at home other than the bathroom? If you're looking for some prep tips for your guest bathroom in time for the Labor Day overnighters, consider these suggestions. 1. Keep it cool. No matter your personal color preferences, don't go too gloomy or bright with your guest bathroom hues. Keep the color scheme cool and airy - light blues and creamy whites. And be sure there's a plentiful natural light source with operational blinds or curtains, of course. 2. Don't skimp on the vanity. Bathrooms all have a focal point, and it's almost always the vanity. 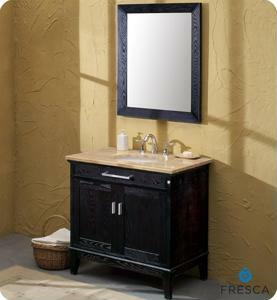 A great vanity shows taste and class while remaining functional and providing plenty of storage. 3. Provide amenities. While there's no expectation that you should offer hotel service, it might make a nice touch to offer your guests a few amenities beyond toilet paper or towels. Stock a nightstand drawer or the linen cabinet with extra toothbrushes, shampoo, bars of soap or any other items your overnighters might have forgotten at home. Don't be subtle about it - leave a note on the bathroom mirror. 4. Get some potted plants. While this is an excellent rule of thumb to follow anywhere in your house, it's especially true in your guest bathroom, where air quality is especially integral, so invest in a potted plant or two. These all-natural air-fresheners are a great way to keep the room's oxygen smelling sweet. 5. Have comfortable towels. Perhaps the number one rule of overnight hosting is to provide the most luxurious and comfortable towels your guests have ever had the pleasure of using. It can make all the difference between an average and amazing bathroom experience.